The term "investor" - when it relates to Wall Street - typically refers to anyone who simply owns a share of stock. However, after taking a step back and examining investor behavior, it's clear that this definition is far too broad. In reality, when someone buys a stock, they are typically acting in one of two ways: as an investor or as a speculator. What's the difference? An investor is someone who carefully analyzes a number of factors to decide exactly what a company is worth, and will not buy the stock unless it is trading well below its intrinsic value. For example, their analysis may lead them to the conclusion that while a particular stock is trading at $38 per share, it's actually worth $52 per share. They make investment decisions based on factual data and removing emotion or a gut feeling from the equation. On the flip side, a speculator is a person who buys a stock for a variety of reasons, but without doing the proper research. This distinction has parallels to how you manage your dealership's used inventory. In other words, when sourcing inventory, do you rely on factual market data? Do you carefully analyze important factors like condition, velocity and price-to-market? Or do you buy simply on price, gut feeling or matter of ease? Here are a couple simple tests you can take to begin examining whether you're approaching inventory decisions as an investor or speculator. 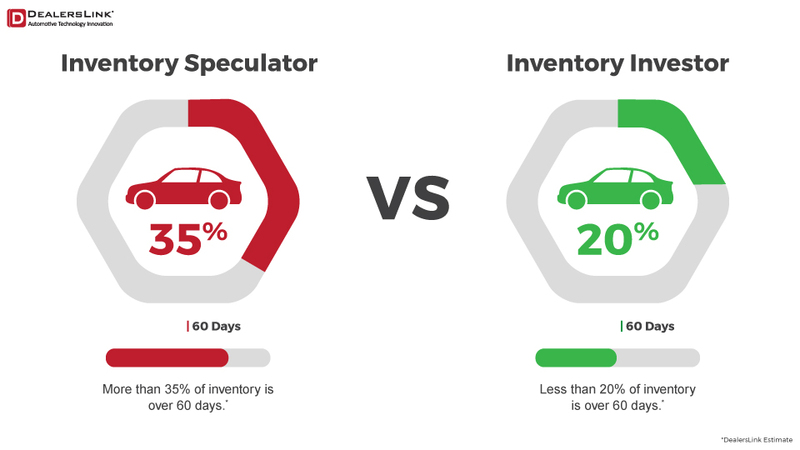 Test 1: What is your oldest used car in stock: If it's under 60 days, you're doing your research on factors such as market day supply and cost to market review, and thus behaving very much like an investor. However, it's over 60 days, you're likely focusing on less important factors, making you a speculator. Test 2: What percentage of your inventory is made up of aged cars over 60 days? : This is another way to analyze your inventory approach. If less than 20 percent of your inventory is composed of aged units, you're clearly an investor. If it's north of 20 percent, you're speculating when making inventory decisions. If these tests helped you determine that you're a speculator, you're not alone. In fact, DealersLink estimates that 35 percent of the average dealer's inventory is aged. This is no different than your financial portfolio having 35 percent of its holdings made up of dead or underperforming stock. Would you let your financial advisor put so much of your portfolio in investments that aren't making you any money? Of course not. So why do the same with your inventory? There is so much technology and data available to help dealers base their inventory decisions on solid facts and less on gut. If you're struggling to make informed decisions, reach out to us for a free consultation with our Advanced Management Trainers. DealersLink provides members with the tools and data they need to quickly and effectively analyze, source and price vehicles...leaving the speculation to their competitors.